EICR Electrical testing advice – If you are a landlord who owns a restaurant, hotel, factory or any commercial premises in Tamworth, Boldmere, Sutton Coldfield or anywhere in the Midlands area. EICR electrical testing is an important part of your business, and this is especially true for businesses which are heavily used by members of the public or have staff working within. Buildings such as hotels and factories are often used around the clock, with large-scale electrical systems which are subject to wear, tear, corrosion, overloading and a whole host of other factors which could lead to deterioration and eventual faults. As guests, staff and visitors are also regularly using the electrics in individual rooms, you will want to regularly check they have been used correctly and are fit for purpose. Electrical testing for businesses is therefore vital. Regular electrical testing by a fully qualified NICEIC electrician in the form of an Electrical Installation Condition Report is a simple and robust way to get your business electrics checked. There are a number of reasons why EICR testing for your Business is important. Here are just five of them. As well as making sure your electrics are safe, getting an EICR-trained and qualified electrician to inspect your installations could even save you money. The EICR tests systems and can identify faults. It could be, for example, that you have an overloaded circuit or a piece of equipment that is overheating and is therefore wasting energy and costing you money. Insurance companies are increasingly requesting that electrical testing is carried out and recorded on a regular basis as part of your policy agreement. Requirements such as this should be detailed in your policy, so it’s important to make sure you have thoroughly read and understood it. 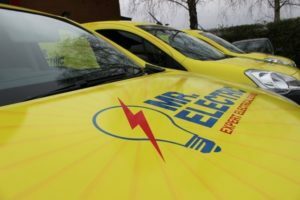 At Mr Electric all our engineers are trained to City & Guilds 2395 Inspection and Testing Level, specifically for the periodic testing and inspection of electrical installations. We have extensive experience when it comes to electrical testing for restaurants, hotels, B&Bs and factories and all businesses large or small.